A new category of games has started to show up on PlayStation 4 called PlayLink games. These are social games, designed to be played in groups of two to four (and sometimes more) with smartphones used in place of the typical DualShock 4 controller. We’ve spent some time with the latest entry in this category, Frantics, and have rendered our verdict in a review below. Frantics has a very unique aesthetic which isn’t seen too often in video games: clay. While it is clearly rendered clay as opposed to stop-motion captured, the result is still pleasing to the eye. Some mini-games have characters dying in brutal fashion, such as skydiving without opening a parachute. But since they are made of clay, each animal simply splats into the ground in comic, rather than tragic, fashion. Whichever graphics engine is running under the hood renders Frantics smoothly, and no hiccups were detected even when playing with a full match of four players. In order for Frantics to even work, each player is required to have a compatible mobile device, whether that is a smartphone or tablet. Most iOS devices will work, and any Android device with an OS version of 4.4 or higher will also do just fine. For our testing, we used two Motorola Z2 Force phones, a Samsung Galaxy S8, and an older decommissioned ZTE ZMAX. Essentially, as long as the device is on the same WiFi network as the PS4, and isn’t too ancient, it’ll work. Developer NapNok Games has made obvious efforts in easing the connection experience, since there is even an option to turn the PS4 into a Wi-Fi hotspot for everyone to connect to in the rare event that a home wireless network is not available. Requiring the use of a smartphone or tablet is something that wouldn’t have worked even one console generation ago. But these days, almost everyone who has a PS4 likely has a compatible device lying around. A quick search on the Google Play Store shows that each PlayLink game has its own dedicated app. While this will keep things simple when launching into a game, having a single PlayLink app that loaded in assets depending on the game currently being played could have simplified things even more. As it stands now, people who buy-in to all PlayLink games will quickly see their app drawers expand as they download more and more of these dedicated apps. The PlayLink app is simple by design. There is only one big PLAY button on the main screen. It quickly scans the local network for PS4 consoles running the game, and then a large button with the play icon shows up. If the auto-discovery fails, there is an option to connect via the IP address of the console, but generally speaking this screen will hardly ever be used for most setups. In my case, I have my PS4 wired in to a separate network from the Wi-Fi, and the game would not show up until I connected the console to the Wi-Fi instead. It was still easy to get to work with four devices in no time. Each player is asked to take a selfie, and their face is matched to an animal. I was mapped to a hound, while others were mapped to animals such as a rhinoceros, baboon, and crocodile. Once all players are set up, the games can begin. Matches consist of four events, with winners receiving crowns, which are crucial for the final event. Frantics is presented as a game show of sorts, with an anthropomorphic fox, simply called The Fox, as the snarky host. He has sarcastic things to say about players as they win or lose, and is constantly dressed in a robe and holding a glass of liquor. Occasionally he’ll bestow extra coins on players who need help, or even “call” one of the players’ phones to let them know that they’re being sent a message, which will detail a secret mission for them to accomplish in the next round. As a result, two or more players can scheme together to try and ensure a certain outcome, all in the name of grabbing more crowns. 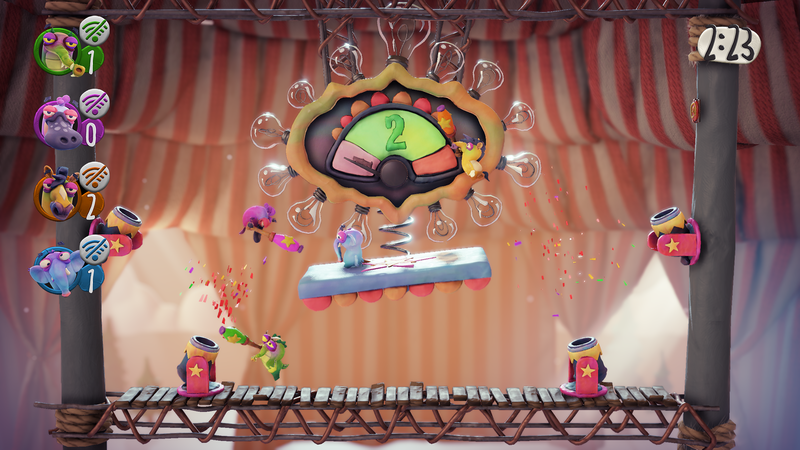 The crowns earned from the mini-games are used as lives in the grand finale event at the end of each match, or as waging currency for certain items to help in the finale. Coins are also used to bid on helpful items in a blind auction in between rounds. You cannot see who bid for what, only who ends up winning which items once all players have placed their bids. So for those who don’t have many coins, it may be helpful to bid on an item that isn’t perceived as popular, as opposed to not standing a chance to win a coveted item like the ninja dash power-up, which is helpful in games where the goal is to stay within a designated zone. Having mobile devices as the controllers allows for a simple yet intuitive control scheme. Some games are controlled by simply tilting the device, occasionally tapping an on-screen button to perform an action. Other games control by swiping on the device’s touchscreen, and one even controls a bit like Angry Birds, as the player chooses a trajectory to launch their characters in rolling office chairs on something like a mini-golf course. There are some creative uses of the many sensors and input methods available on today’s smart devices, which allows for non-gamers to play without having to worry about which button to press. For those looking for a fun party game, Frantics fits the bill nicely. It’s not the deepest game out there, but then again this is targeting the casual demographic. Requiring the use of a dedicated app on mobile phones or tablets is a double-edged sword, as well, but the execution is simple and reliable. For about $20 USD, Frantics will provide gamers and non-gamers alike something entertaining to do at a get-together without burying their face in a small screen. Frantics review copy provided by publisher. Version 1.01 reviewed on a PS4 Pro. For more information on review scores, please read our Review Policy.